Elon stayed up late writing that drek? OK, with that out of the way, let’s look for a few clues in the upcoming Q2 reporting. First, loss per car. 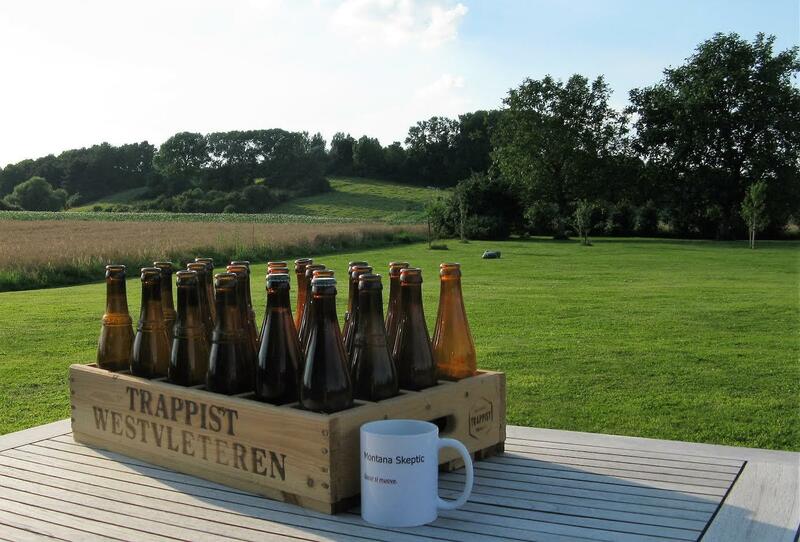 But not the way our good friend, Anton, defines it. Next, let’s see whether Tesla is keeping its capital expenditure promises. Finally, time to revise 2016 delivery guidance? The vital signs are weak, but perhaps Tesla can apply more price cut defibrillation paddles to jolt demand. 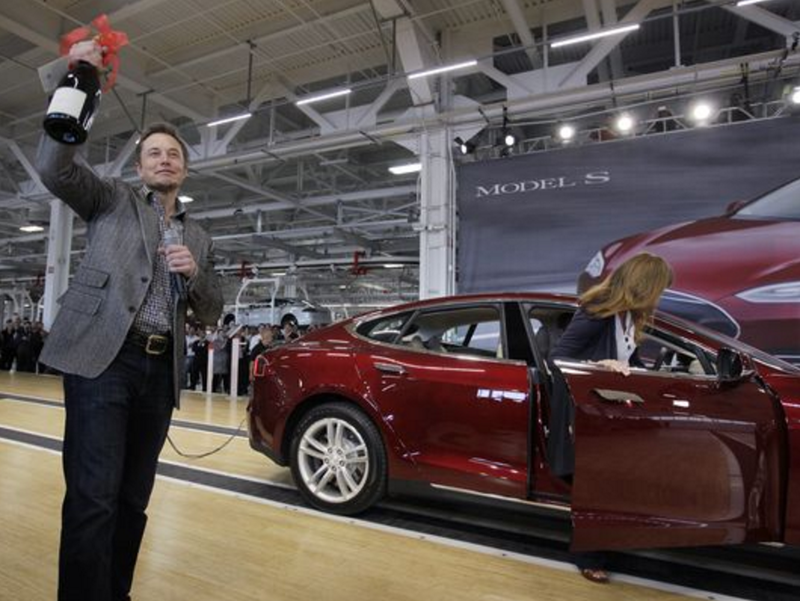 Tesla (NASDAQ:TSLA) will report its Q2 financial results in early August. There will be added fun this year because SolarCity (NASDAQ:SCTY) will be reporting its results near the same time. I trust everyone has recovered from the staggering revelations of “Part Deux” of the Secret Master Plan. The first master plan (Part Un?) put Tesla in a hole that’s only $4.2 billion deep, and I’m confident this one will have even more impact. By the time you read this, it will have been said, many times, many ways: this “secret master plan,” besides being underwhelming and uninspired pablum, is a transparent effort to create a justification for Tesla’s acquisition of SolarCity. The combined company, Musk promises, will “create stunning solar roofs with seamlessly integrated battery storage.” With stunning roofs, who needs a synergies analysis? …Tesla engineering has transitioned to focus heavily on designing the machine that makes the machine – turning the factory itself into a product. A first principles physics analysis of automotive production suggests that somewhere between a 5 to 10 fold improvement is achievable by version 3 on a roughly 2 year iteration cycle. The first Model 3 factory machine should be thought of as version 0.5, with version 1.0 probably in 2018. Memo to Elon: a car factory is not a machine that builds the machine. A car factory has machines that the build the car. Memo to Model 3 reservation holders: Elon Musk just told you that you won’t be seeing Model 3 cars in 2017. Which, of course, is what I’ve been telling youfor a quite some time. Memo to Tesla shareholders. This is a betrayal of your loyalty. But, please, be my guest, and vote for the merger. After all, I’m holding long-dated puts. OK, back to Tesla’s Q2 financial results, which will be released in about two weeks. What part of the financial reporting will provide us with important clues? And what are the data showing about current levels of demand for the Model S and Model X? Once we have the Q2 results, we’ll check back to see how things actually shaped up. 1. What’s the trend with Tesla’s profit or loss per delivery? Anton Wahlman is regularly and roundly criticized for his “loss per car” calculations showing Tesla racking up a loss of more than $19,000 for each car delivered. Wahlman takes incoming not just from Tesla bulls but also from some Tesla skeptics. Among those who believe Wahlman grossly overestimates the “true” per-car loss is Seeking Alpha member notasmidgeon (NAS). NAS has his own formula for arriving at what he regards as a more realistic figure. For each quarter, he begins with a simple fraction whose numerator is the GAAP earnings and whose denominator is the number of cars delivered. Taking cues from Bryce_in_Texas (whose superb piece on RVG accountingshould not be missed), NAS then adjusts the numerator by adding gross margin that was deferred because of resale and residual value guarantee accounting. NAS also adjusts the denominator by subtracting from it the number of delivered cars resulting from direct leases by Tesla Finance. If you’re thinking Tesla might become profitable any time soon, this trend is not your friend. Of course, I can already hear Tesla believers protesting it’s wrongheaded to discuss loss-per-car for Tesla. 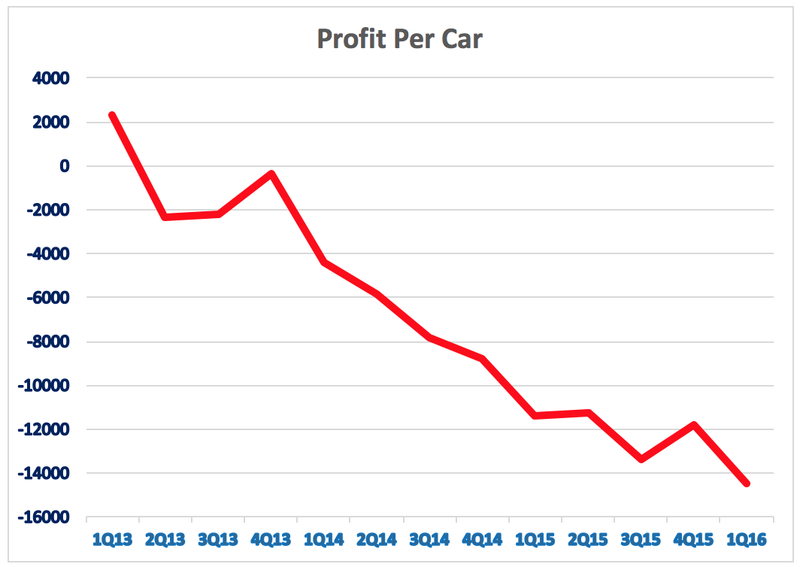 The most oft-heard claim is that, over time, as Tesla scales up, the losses per car will reverse and become profits per car. If the critics had a fair point, I would expect the trend to be going in the other direction. After all, I’ve been hearing these protests from the critics for a long time. But as more time goes on, things get only worse. Anyone care to guess whether this trend continues in Q2? I’ll go first. Yes, the loss per car will be a record high in Q2. Again, I’ll go first. It will be another new record, because it’s in Q3 that the effects of the recent price cuts for the Model S and Model S will first be felt. 2. Is Tesla telling the truth about capital expenditures? As I have said before, I suspect Tesla has been less than candid about it capital expenditure intentions. Paulo Santos shares my doubts. In its February 10 letter to customers and shareholders, Tesla guided for $1.5 billion of 2016 capital expenditures. That works out to $375 million per quarter. Three months later, in conjunction with its Q1 quarterly report, Tesla announced its accelerated Model 3 production schedule, and consequently increased its 2016 guidance to $2.25 billion. At the same time, though, Tesla revealed it had spent only $217 million on cap ex during Q1 – in other words, $158 million less than it needed to meet the earlier, lower guidance. To meet the revised annual guidance, Tesla will need to average $678 million of cap ex over each of the final three quarters. This entire sequence is weird. Tesla badly needed its originally announced level of capital expenditures $375 million per quarter) just to continue expansion of its Supercharger network – which in a year will be swamped with Model 3 cars (per Tesla, in all events). Moreover, Tesla’s service centers already were strained before the Model X, and with all the preparation time and rework required by the faulty Model Xs, wait times (per anecdotal reports) have become even longer and (to those waiting) more exasperating. More service centers were badly needed. So it was that Tesla promised, in conjunction with its most recent Annual Report (published last February) that during 2016 it would build 80 new Sales/Service Centers and 300 new Superchargers. That worked out to 75 new Superchargers and 20 new Sales/Service Centers each quarter. So, how did Tesla do in Q1? It completed only 19 new Superchargers – 56 fewer than its target. Seeking Alpha contributor “the future is friendly” (TFIF) has gone to some source materials to estimate Tesla has opened 100 Superchargers in 2016. If that’s close to accurate (and TFIF cautions that the number is imprecise), then Tesla is about 50 Superchargers behind schedule this year. In its Q1 reporting, Tesla didn’t reveal the number of new Sales/Service Centers, but it quietly shrank its 2016 plans for new Sales/Service Centers from 80 to 70. In other words, when it comes to capital expenditures, there appears to be a significant gap between what Tesla says and what Tesla does. If Tesla actually were to meet its Q2 and Q3 capital expenditure targets, then it would burn $1.36 billion on capital expenditures while at the same time incurring negative cash flow from operations of at least $300 million. Add it up and guess what: the entire $1.7 billion capital raise from May is gone by October. That would leave Tesla at the mercy of its revolving credit lenders if it wants to extend a bridge loan to SolarCity. I’ve already outlined why I doubt those lenders will allow it. At a minimum, there will be lots of arm-twisting and shuffling of the lender deck. That is why, Mr. Tesla Owner and Mr. Tesla Shareholder, I believe Tesla is just playing games with you. Jason Wheeler is doing everything he can to conserve cash. He will make sure Tesla falls far short of the $678 million capital expenditures target for each of Q2 and Q3. In time, of course, there will be a price to pay. Without the cap ex now, the chances become even more slender that Tesla will produce the promised 100,000 to 200,000 Model 3 cars next year, or even in 2018. But Tesla will think of that tomorrow. After all, tomorrow is another day. 3. Will Tesla revise 2016 delivery guidance? OK, that’s a trick question. Tesla already has revised 2016 guidance, even if it cleverly disguised the announcement. In total, Tesla expects to produce and deliver about 50,000 vehicles during the second half of 2016, approximately equal to all of 2015. So, 29,190 delivered in the first half of 2016 plus “about 50,000” in the second half brings us to “about” 79,190. In other words, high-end guidance is no longer 90,000 and low end is the new high end. Will Tesla guide even lower in the upcoming Shareholder Letter or conference call? It should, even though I doubt it will. Let me share with you how dismal demand is looking right now. There is almost no Model X order backlog. What’s up with the delay on delivering the five-seat versions? Early this year, some speculated perhaps Tesla was going to equip the five-seat version with fold-down seats. That dream has died. Some now speculate that structural changes may require crash testing recertification. More Model X owners are listing their cars on eBay. As of last weekend, 58 Model X cars were either listed on eBay or have been sold from that site. The number sold appears to be less than half the total. A good number of those still for sale have been re-listed for six months already. A lot of them appear to be held by dealers. There are plenty of inventory Model X cars available. Reports from six different locations across the United States indicate that Model X inventory cars are available at sales centers. Numbers tracked by temagami indicate that through Q2, Tesla built about 2,500 more Model X cars than it delivered. Sure, on June 30, some of those cars were en route to customers. But others can be found on Tesla lots around the country. Tesla’s recent price cut, disguised as a Model X 60D version, underlines the soft demand. Model S 60 versions are cannibalizing higher-end Model S sales. In the three months before the lower priced Model S 60 versions were introduced (on June 10), Model S sales were breaking out to about 47% for Model S 75 versions and 53% for Model S 90 versions. 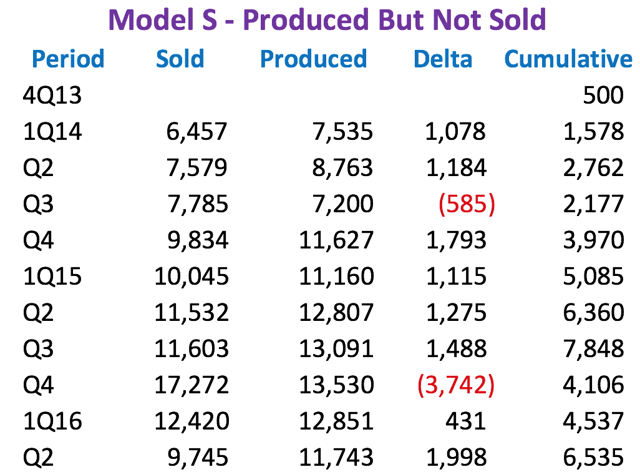 Since the lower priced version, however, the Model S 60 versions account for about 60% of orders, while the 75s have shrunk to about 15% and the 90s to about 25%. Where are the higher margins? On the higher priced cars, of course. Model S inventory is building. There is a huge build-up in Tesla Model S inventory, particularly of P90D versions, both in the U.S. and in Europe. Perhaps Tesla is fundamentally changing its marketing and will now shift toward selling from inventory. Or, perhaps the inventory build-up results from Tesla’s desire to achieve manufacturing efficiency, which requires a constant run rate for Model S production. Or, perhaps this is a one-time event because of the styling refresh. Or, perhaps this is simply a function of demand having gone very weak. There is a lot of evidence for the demand-has-gone-weak hypothesis, and it’s the one I’m entertaining based on all the data I see. Q2 deliveries were terrible and Q2 operating losses will be frightful, too. Q3 deliveries will be better (demand is elastic, cut the price and you can increase it), but Q3’s operating losses may be even worse than those of Q2.